Protecting yourself and your assets is important to you; your cars are insured, and you have homeowners or renter’s insurance beyond the bare minimum. Knowing you and your assets are covered in the event of property damage or bodily injury gives you peace of mind. You’ve got good Omaha liability insurance coverage on your side and limits that are meant to protect your family and property. But are those limits high enough? Many people don’t realize how quickly the cost of property damage or medical bills can mount. In the event of a car accident, for instance, a combination of vehicular damage, injury, and legal costs can burn right through your coverage leaving you to foot the remaining bills. This is where umbrella insurance comes in. Umbrella insurance, as the name suggests, is an insurance policy that covers above and over your standard home or auto insurance. It’s, essentially, coverage to protect against catastrophic liability claims. If you cause an auto accident that results in serious injuries to other parties, the legal liability will be huge. You can be held responsible for all of the injured party’s medical bills, rehab costs, lost wages, etc. Everything to make the injured whole again can, and likely will, be your legal burden. Generally speaking, umbrella insurance is both easy to get and affordable. The main prerequisite is simply that you carry home and auto insurance policies with $250-500,000 in liability coverage. The umbrella insurance coverage doesn’t kick in until your normal insurance has maxed out. It’s recommended that you start an umbrella insurance coverage at $1 million. While that may sound high, you must consider the costs associated with a “catastrophic accident”: settlements, medical bills, and property damage can easily get close to $1 million. By giving yourself ample umbrella insurance coverage, you protect yourself from hefty payouts, garnished wages, or debt. Of course, when deciding on your coverage limit, it’s important to consider your assets and wages. By talking to your Omaha liability insurance company, you can determine the best level of coverage to protect your family and assets. While fixing or replacing a car might be the work of a $30-60,000, long-term medical bills certainly are not. If you are found at fault in a car accident resulting in serious or long-term injury such as paralysis or debilitation, the expenses will blow past most limits quickly. Umbrella insurance will help cover those costs and settlements, whether it’s for serious injury, multiple people, or managing damages. Even more important, your own assets and wages will be protected, as it is not uncommon to garnish wages for years to come in the event of a long-term injury settlement. Whereas your standard auto insurance will cover the cost of the damage to the cars and the beginnings of medical bills, anything beyond that is on your own dime if you don’t have umbrella insurance. Say someone slips and falls on the ice on your sidewalk. Or your dog bites a child. Events like these can lead to extensive costs in settlements and damages that many insurance policies won’t or can’t cover in full. An umbrella insurance policy can swoop in to cover any damages past the liability limits or any specific scenarios not covered by your homeowner’s policy. Umbrella insurance will also cover legal defense costs in the case of a settlement, which are plenty expensive on their own. Like the umbrella it’s named after, an Omaha umbrella insurance policy will cover all the gaps and holes of a standard insurance policy to keep you protected. In the day and age of social media, lawsuits are even easier to come by than they used to be. People have been sued for posts and blogs for anything from trademark to slander and libel. 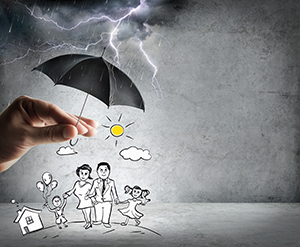 In the unlikely event of a lawsuit that has nothing to do with your physical property, an umbrella insurance policy can help cover your legal costs and payout from potential settlements, so you don’t lose your wages or property. It’s pertinent coverage for this day and age that your liability insurance probably doesn’t touch. Don’t wait! While serious accidents like those above are unlikely, they are still possible, and you want to be covered if you’re ever part of one. Luckily, getting an umbrella insurance policy is easy and affordable. Just call up Chastain Otis Insurance, your local liability insurance provider in Omaha, and ask them about their umbrella insurance. It’s a simple policy with little paperwork or decision-making and can cost as little as $150 a year for a couple with two cars and a house. There’s no reason to wait on protecting yourself and your assets, particularly when your neighborhood Chastain Otis Insurance is ready and waiting to get you covered under an umbrella insurance policy. Contact us to get started today!